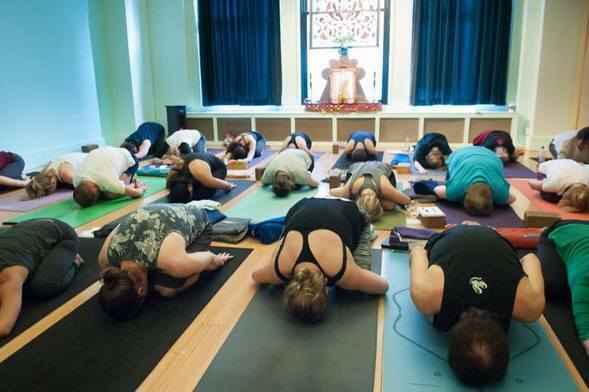 Every day, 500+ people visit the 12,000 square foot Jivamukti Yoga School in downtown Manhattan, one of the largest and oldest yoga centers in the U.S. The New York school was the birthplace of Jivamukti Yoga. Ahimsa is integrated into all aspects of the school. The school’s interior incorporates such eco-friendly materials as reused and recycled furniture, non-toxic building materials and water saving fixtures. And the roomy classrooms—with high ceilings and stained glass panels adorning the windows—provide a sublime setting for practices designed to lead one to enlightenment. The entire school was designed with compassion in mind—compassion for all beings and for the planet. Under the bamboo flooring in the asana rooms is padding made of recycled car tires. There’s a special ventilation system that pulls the sweat out of the asana rooms and circulates the rooms with fresh air. Consciousness beyond the mat is what’s happening here. The school has 3 large asana rooms, a 60-seat café, a massage and well-ness room, student dressings rooms and a large community office shared by the staff of 108 employees who maintain the school.